The Digital Divide Between McCain And Obama Presidential candidates John McCain and Barack Obama use technology in very different ways. 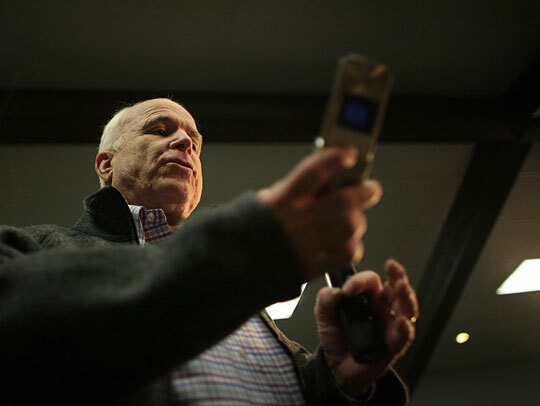 Obama is an avid BlackBerry user; McCain favors his Motorola Razr phone and says he rarely uses e-mail or the Internet. 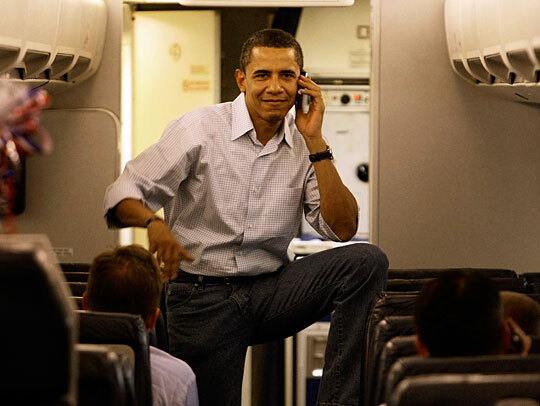 Democratic Sen. Barack Obama of Illinois talks on his cell phone as he boards his campaign plane in May. McCain checks his cell phone during a campaign speech last December in Des Moines, Iowa. Presidential candidates John McCain and Barack Obama have very different digital resumes. Their habits were shaped, in part, by what they were doing when the digital age arrived. Obama has been seen walking with his BlackBerry — so absorbed you worry he might bump into something. McCain, on the other hand, says he rarely uses e-mail or the Internet. Today, Obama has more than a million friends on Facebook. But 10 years ago, he was just a state legislator in Illinois with a single cell phone. "He was pretty with-it. I won't say he was the earliest adopter. But he was an early adopter," says Dan Shomon, who worked as an aide to Obama at the time. And, yes, Obama used the Internet. He had to. The Illinois Legislature put all the bills and amendments online. All lawmakers were issued laptops. "While you were sitting there for hours and hours and hours during the session, you could surf the Internet and look for plane tickets, look at ESPN.com and the Chicago Tribune.com," says Shomon. "That was a time where a lot of legislators really advanced their Internet skills." Obama has been using a BlackBerry for some time. When he ran for the U.S. Senate in 2003, his campaign decided it needed them, too. So, Obama's inventory of personal gadgets grew. "He always had the cell phone in a clip on the side of his belt," recalls Shomon. "Then, he had his BlackBerry clipped to the side. So he had two clips." But too many people called the cell phone. Shomon says everybody and his brother had Obama's number. So he had to get a second phone. And then he had three technological devices strapped to his waist. Technology made Obama's life more complicated. Shomon, who worked as the campaign director, remembers seeing Obama on two phone calls at once and tapping away at the BlackBerry. "Ultimately, when he was pushed into the Internet age and into the BlackBerry age, he resisted slightly. But he realized the benefit and the necessity," says Shomon. The Obama for Senate campaign had a blog, which was relatively new in politics, though Shomon says it was mostly written by a staffer. Again, technology was a tool. John McCain's digital resume is considerably shorter. During the Republican primary, he referred to himself as computer illiterate. Earlier this month, he told The New York Timesthat he depended on his wife and staff to show him Web sites. "I am learning to get online myself," McCain told The Times. "And I will have that down fairly soon — getting on myself. I don't expect to be a great communicator. I don't expect to set up my own blog, but becoming computer literate to the point where I can get the information that I need." McCain explained he didn't feel the need to send e-mails. E-mails do have a way of sometimes leading to misunderstandings. McCain economic adviser Douglas Holtz-Eakin says the senator prefers to use the phone. "He has a tremendous appetite for information," says Holtz-Eakin. "His favorite toy in the whole world is his Motorola Razr phone, and he flips it open and consults experts directly." When you're a senator, you can do that. And McCain has been in Congress more than 25 years. He went through the challenge of being in elected office before the Web existed. Since then, he's had a staff to handle some of the tasks for which the rest of us turn to the Internet — such as tracking down information or finding driving directions.